Watch Thugger take over a new office at 300 Entertainment. 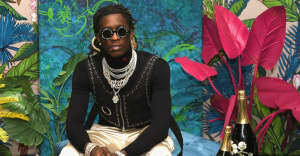 Young Thug has apparently launched his own label, YSL Records. The imprint appears to be an offshoot of 300 Entertainment, the Lyor Cohen-helmed label and promotion company that reps Thugger, Fetty Wap, Migos, and more. A video posted today on XXL compiles a handful of snaps from Thug's Snapchat story that show moments from a celebration at the 300 office, including 300 co-founder and former Def Jam vet Kevin Liles making an announcement in front of an office bearing the YSL logo. "[Young Thug] starting a new venture is going to take us to a different mindset," says Liles in the clip. Other snaps show Thug and Lyor chatting while Lyor, who's slated to leave the company in December for YouTube Music, pulls out a gold YSL chain. A rep for 300 did not immediately respond to The FADER's request for comment.